The growing convergence between medical device and consumer electronics has not only brought some incredible innovation to the end user it has also brought an interesting kind of pressure to the design and manufacturing world. The general population of the modern world has come to expect that all of their devices, medical or not, be ‘smart’ in some way. There is also a growing expectation that a devices built for a special purpose now function in multiple and sometimes in completely foreign ways. It wasn’t a stretch to accept that a hearing aid could double as Bluetooth connection between a mobile phone or television, but what if it also took your temperature, measured your heart-rate or counted your steps? It’s already connected to your body so why not? Think of all of the items worn by individuals that could have multiple functions. Any one of them could function as a medical device (or quasi-medical device) – many of which already do. So what’s next? This demand is not only for at-home personal care devices, but for the doctor’s office as well. The “smart” diagnostic device, surgical tool or delivery apparatus is of equal interest among medical professionals. This interest is also compounded by the fact that there is need for these tools to be smaller, less invasive and in many cases disposable. What do these demands and interests do for the already crowded and complex device? How can they even be manufacturable? The demands on tomorrow’s medical device is stretching beyond the standard supply-chain capabilities in many ways and it has become necessary to enlist new technologies to push the limits of device design. One of the key technological innovations that enables the design and manufacture of next generation medical devices is micro moulding. This technology has allowed devices to shrink in size, become more complex, reduce manufacturing efforts and open design to new possibilities – with it, however, has come a series of common questions as to the best ways to understand and utilise micro moulding to its fullest. Understanding the answers to these important questions will allow for better and quicker device design efforts. While micro moulding as a technology isn’t necessarily new the interest level is at an all-time high – and so is the confusion of what it is and how to design for it. Part of the definition includes something related to the term ‘micro’ but there is not a standard textbook definition. 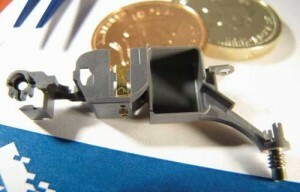 In general, micro moulding can be looked at in one of three ways: moulded parts that are micro in size, micro in features or micro in tolerance. While in many cases a part design could include all three aspects any one of these can define true micro moulding. Drawing the line between micro moulding and conventional moulding is not cut and dry. It may be safe to say moulded parts under 1 mm in size are for sure micro, it’s important to note there can be larger parts with features that are well under 1 mm, even approaching 1 µm or less that can also be considered micro moulding. While the overall dimensions of the part are “big” the features demand a skill in mould design and processing beyond most conventional approaches. The same goes for tolerances. Everyday positional or geometric tolerances for micro moulding are around 25 µm and start to push the limits around 2 or 3 µm. Larger moulded parts with tolerance expectations near these numbers can also be considered micro moulding. There is also some confusion that micro moulding is only defined by the press size being used to mould the parts. The press size does play a critical role in micro moulding but only for the same reasons one would pick a large press for larger parts. The moulding machine must match appropriate efficiencies to the part design so that less material is wasted and the tool can be balanced and controlled very precisely, especially when using expensive implantable materials and/or when the tolerances on the part design are very tight. In theory any sized moulding machine can make micro parts, however there are practical and physical challenges the larger the mismatch between the part size and press size. One of the best ways to tell if a part design is approaching micro moulding is by the reaction of the supply chain. It will be fairly evident how difficult the part design might be by the number of ‘no-quotes’. Seek out those that consider themselves as experts in micro injection moulding and tooling to gauge efficacy of the project when unsure. How is micro molding different from conventional moulding? In the most basic of comparisons there is no difference. Just like with conventional moulding, micro moulding is an injection moulding process with all of the standard requirements that any moulded project would require. For example, just as with the conventional method, any micro mould design will require a way to process and inject material into the mould cavity, the mould will require the ability to open and close, and the moulded part will still need to be ejected in some fashion. These requirements are most often overlooked when someone is new to micro mould design. There is nothing magical about micro molding that allows the process to skip the conventional requirements.